There is a myth today that says we must get our life organized and in order before we follow God’s call. Our kids must have adequate time with us. Our debt must be paid down. Our days must have space … and peace. After all, how can we do great things for God when we don’t even have time to spend ten minutes in prayer? How can we give from a empty well? How can we spare what we don’t have: whether it be time, money or energy. Yet God’s call never waits for us to unclutter our lives. In fact, He usually calls us when we have nothing to spare. Why? When we don’t have anything to give, we look to the Giver. When we have no time, we must readjust our priorities and set things according to God’s schedule. When we feel foolish and inadequate, we’ll look to God’s wisdom. When we feel wrung out, we’ll look to His strength. And in the midst of following Him, we’ll find Him. When John and I were busy with careers and older kids, God called us to adopt. When I was a busy homeschooling mom and writer, He called me to help start a crisis pregnancy center. When our family was settled in Montana, God called us to Arkansas—and to an inner city church. When I had not a moment to spare with book deadlines and kids, He’s continued to call me to serve and inspire teenage moms through our Teen MOPS support group. Even last week when I had family visiting and a book deadline, God called John and I to help a teen mom move her and her kids. She was blessed. We were blessed, too. Instead, I’ve discovered that when I do God’s work He takes care of mine (the deadlines get met, the kids get cared for). Yes, the words for the books and blogs come when I’m too tired to think. And my children are trained on what following God looks like. How do you know what God’s calling you to do? There’s a burden on your heart you can’t shake. There is a specific person you know of who needs your help. The Scripture passage that you read encourages you to have faith and step out. When you pray you have a sense that God is asking you to act. You don’t have time, but you have a seed of faith. You feel as if you can’t do it alone. There are many things that can occupy our time—there always will be. There are good things that we can devote our lives to, but the most important things are the God things. When you do decide to step out your schedule won’t automatically clear, it never does. Instead, God will show up. He will give you extra wisdom, energy, resources and strength. But mostly He will give you Himself! And when you have Him, you have everything. And when you give others the knowledge of Him, they can have Him, too. And when lives around you are transformed, all the stuff you were busy with doesn’t seem as important any more. And God is glorified, because it’ll be clear to everyone that it’s Him doing the work! How about you? What do you feel God calling you to? What are you doing about it? Father God, you have blessed me with so much. Thank you for the unique life you given me. Help me manage my time and resources wisely. Guide me as I look to what you are calling me to do and give me the strength and wisdom to fulfill my purpose. Thank you for this reminder. When asked by a friend to be a MOPS mentor, all i could think was, “God, i don’t have the time and i don’t feel worthy enough.” I thought the same thing when it came to writing. I am finding that when God wants me to do something, He makes time. Or gives me the energy to stay up late and write. This is a wonderful post (and I love this whole blog). I had a small experience like this just yesterday. My family is in dire financial times, and I had an appointment to meet with someone to hopefully get some utility assistance. At the last minute I couldn’t find the right documents, so I gave up and went to bible study instead. As I was leaving church, I was pulled aside by someone I serve with who couldn’t leave but needed someone to pick up a girl we serve with. This girl had surgery last month and was at school yesterday and was having an allergic reaction to something. I was the only one available to go get her, and had I been at this appointment, I wouldn’t have been. God put me where He needed me to be. It was a blessing for everyone involved; very much so for me. God will take care of my finances; He has never dropped the ball on us before. I love that Caitlin! It’s amazing what happens when we trust God. 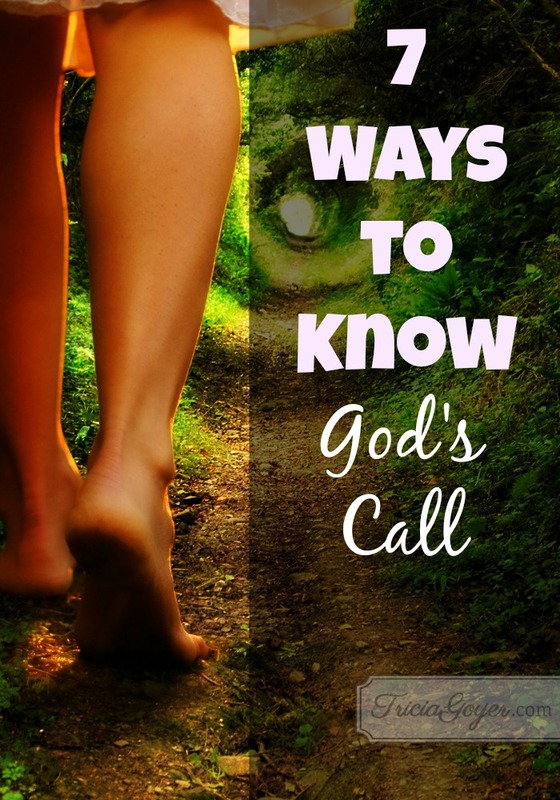 Thanks for the 7 ways to know and recognize God’s call. Everything you wrote was immensely helpful! Thank you. I have found that when God leads me “to the right place & at the right time” I have a sense of peace and renewed energy. Yes! Thank you so much, Charlotte! Thanks, Tricia. Your words of wisdom and encouragement were needed. Great post! It breaks my heart when as a Women’s Ministry Leader I’ve asked women to serve and they immediately respond that they are too busy. Although I ask (and sometimes beg) them to pray about it before giving me a definitive answer, in their mind they’ve already decided God doesn’t want them to take on one more thing. Thank you for reminding all of us that God can and does call us when our plates already seem too full. I agree! Sometimes God’s plans are different than ours. I am immensely encouraged by your post. In the last few months I have been nursing a dream that seems to keep growing and becoming more defined. Been praying for confirmation and for God to tell me to go and do. How did you know for sure when to act? Is it just a matter of faith? Yes, it’s a matter of faith! Trust God and take a big leap! Thank you. This was a great blog to read on a Monday morning. Yes, God will fill in all those places with Himself! Thank you for this post. I have been called to write and speak to women about marriage, mommyhood and spiritual life. I keep pressing into to the Lord and He is making a wonderful way. I appreciate your blog and find tremendous guidance from your posts. Thank you Tricia, I needed this to remember how God has worked in my adult life and to realize He has me in a time of necessary rest, which I was fighting I think. I know I need to grieve some goodbyes, welcome some new opportunities and always, always, thank Him for His provision. God Bless You for hearing and embracing all that He puts in front of you. Susie, rest is important. I’m excited to hear what God has in store for you! This spoke into my life and I am grateful. One of the things that particularly jumped out at me was “When we feel foolish and inadequate, we’ll look to God’s wisdom.” That and just feeling wrung out and tired but it is so worth it to see God work. First of all working in me and exposing and purging me in the process of obeying His calling. Then to have that trust that God is indeed meeting all those deadlines and taking care of mine and my families needs. God will be strong through you even when you are weak. Keep seeking Him! Tricia, great post, may God keep on blessing your journey, you’ve truly encouraged me on mine. Thank you. This is such a beautiful and blessing article. God will bless those who blesses you. Stay encouraging others as God continue to use you to strengthen your surroundings and community. Firstly i want to thank God and the holy spirit to guide and show me this morning where i falling short and how to kn what is my calling but i had never known cause i always say to myself how do u kn what is ur calling but after reading this it helps me in that part and secondly i want to thank God for using u to help others .